Learn more about RF Integration’s MMIC capabilities and what we can do for you? IC Design at microwave and mm wave frequencies provides some unique challenges. Key areas that can affect performance are the inductance of via holes, die thickness and the consistency of the die attach material. Optimizing bond wire length, substrate and die thickness or via hole placement and wirebond control is critical. The quality and maturity of the process and the design tools determines the overall level of risk in an MMIC. This is particularly true in millimeter wave designs where the normal RFIC design process needs to be augmented with full EM simulations. RF Integration has the technical expertise to ensure that these practical considerations are included in the design and that the final chip performs to expectations even at mm wave frequencies. The sensitivity of device performance to small errors in modeling, subtle layout affects or assembly variations is quite high. It is crucial to have a well thought out test structures and design variants that can be evaluated commensurate with the design. "Ideal" lumped element inductors and capacitors with appropriate circuit parasitics for the band of operation are used to establish the initial design trade offs. The next step is to implement the design with transmission line sections or detailed models that incorporate the full parasitics of each element. Series inductors are realized as short lengths of high impedance transmission lines. Series capacitors are realized as standard MIM (Metal Insulator Metal) structures. Shunt capacitors are implemented as open circuit distributed transmission lines. 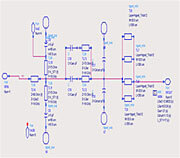 An MMIC design flow using Agilent’s ADS tool set allows the layout to be developed in parallel with the design. This is crucial for microwave and mm wave frequencies, since a clean layout is the single largest factor in achieving the required performance. Variations over voltage, temperature and process are evaluated and the overall design is centered. EM simulations of critical on-chip and off-chip transitions are included in the design. Finally design variants and test structures are optimized and laid out. At each stage, the layout is reviewed for performance degradation due to circuit parasitics. Full electromagnetic (EM) simulations of coupling, bond wires, ground inductance and on-chip matching structures are required. High power microwave and mm wave performance requires unique process technology with capabilities in GaAs PHEMT, HBT GaN and MHEMT. Our strategic relationships with best in class GaAs foundries ensure that the selection of the optimum process technology based on required performance, technical risk and cost competitiveness. RF Integration can serve as the primary foundry interface or support the customers process selection. RF Integration’s engineers have developed products ranging from high performance building blocks to complete phased array MMICs for radar and communication applications.